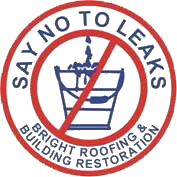 If You Have An Emergency Leak Situation, We GUARANTEE to Stop the Leak Within 5 Hours! When You Have Water Pouring Into Your Building from a Leaky Roof, The Last Thing You Want to Hear from Your Roofer Is, "We'll Be There as Soon as the Rain Stops!" A leak at your facility can cause damage to interior equipment, dripping on your telephone equipment, and dripping onto the President's desk, all resulting in a loss of business time and an irritated boss. You call the roofing guys and they tell you they can't come until it stops raining, that's when it would be most convenient for them. And if they did show up they'd do "what they can"; translation: they push some water around, put some plastic in your ceiling, put a bucket over here, and don't fix anything. Here at Bright Roofing, if you call us during the rain storm with an emergency situation, we guarantee to be there to stop your leak within 5 hours! We'll put on our rain gear and boots and struggle with the weather conditions to relieve the pressure of the leak and give you a solution to your problem. Most conventional roofing materials will not stick in wet conditions. So we found a revolutionary compound that works in every weather condition to solve your problem. 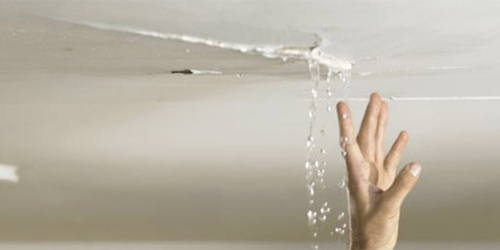 We can stop your roof leak, even while it's still raining. This revolutionary compound is like a radiator stop leak. Remember the old days when you had a hole in your radiator and you poured it in while the engine was hot and it circulated and plugged the hole? The same kind of thing is available to us today. If we find a gash in a roof, we can put this compound on it (even in the middle of a rain) and it swells up and stops the leak. It isn't a long term solution, but it's a great immediate fix! If you have an emergency leak situation, call us right away at 313-963-7733. Our fully equipped trucks are staged and ready to respond to stop your leak within 5 hours!